Meanwhile Tunisia’s revolution isn't going so well. In early December, 1989, rioting broke out in the western Romanian city of Timosoara. Within weeks, the Ceaucescu dictatorship had fallen, the self-styled ‘Genius of the Carpathians’ and his wife, Elena, having been shot by an impromptu firing squad after a trial that was little more than a kangaroo court that condemned them for one of the things they were not guilty of: genocide. Before she was killed, Mme. Ceaucescu is said to have screamed, ‘You are murdering the mother of the nation.’ Discontent had been building since the beginning of the 1980s, when Ceaucescu instituted a disastrous program of economic austerity that further impoverished an already poor population, and by 1987, demonstrations by both workers and students were becoming more and more frequent, and fear of the regime less and less pervasive. At the same time, there was increasing restiveness about Ceaucescu’s rule within the Romanian Communist Party. Something of the same suspension of disbelief has greeted the overthrow of the Ben Ali dictatorship in Tunisia. And yet the parallels between what actually took place in Romania in 1989 and what is taking place in Tunisia now are discomfiting. Both crises of the regime began with popular demonstrations that seem to have been spontaneous and to have taken even long-time opponents of the regime by surprise. But in both cases, the actual overthrow of the tyrant seems to have been the work of members of the governing elite—dissident members of the Party and the Securitate in Romania, the army and senior members of Ben Ali’s own government in Tunisia. In Tunisia, the transitional government set up after the head of the army, General Rachid Ammar, forced Ben Ali into exile in Saudi Arabia, initially was comprised largely of men who had faithfully served Ben Ali for years, including the dictator’s hand-picked prime minister, Mohammed Ghannouchi, who remains in office. The popular outrage at this was so great that Prime Minister Ghannouchi was forced to secure the resignations of the most prominent of these figures, notably Ben Ali’s ministers of foreign affairs, interior, defense, and finance, all of whom had tried to hold on to their posts. 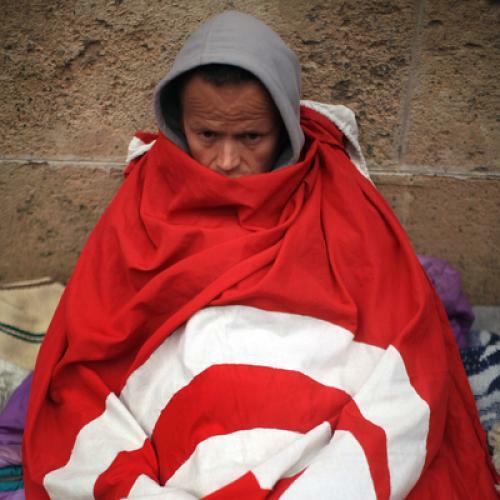 And in the streets of Tunis, and the other major Tunisian cities like Sfax and Bizerte, demonstrators have begun to carry signs with slogans condemning the ‘theft’ of their so-called Jasmine Revolution. It is impossible to predict whether the Jasmine Revolution will follow what many Romanians now call their ‘Stolen Revolution.’ But there are signs that point in that direction, notably the renewed use of force to break up demonstrations against the Ghannouchi government. To be sure, Tunisia in 2011 is a far more civilized place than Romania was in 1989. We are a long way from rent-a-thugs from the Romanian coal fields ready to do the regime’s bidding. To the contrary, Abdessaram Jrad, the leader of Tunisia’s independent trade union, the UGTT, has been trying to broker an agreement between the demonstrators and the interim government. Another reason why there are no grounds yet for despair is that Ben Ali’s power base was in the security services from which he himself had come, whereas it is the Tunisian army that holds the balance of power in the country at the moment, and the army has no history of seeking to run things. But this is their first real opportunity since independence, and no one yet knows for sure what General Ammar will do with his new-found political centrality. But whatever the eventual outcome, it is a mistake to consider the democratic revolution in Tunisia as a fait accompli. Nothing could be further from the truth. In contrast, the profound, positive symbolic effect of the Jasmine Revolution on the pro-democracy uprising in Egypt—whether that uprising ends well or badly—is an undeniable fact. Egyptians (and, to a lesser extent, Yemenis, Libyans, and Jordanians) have seen the unimaginable—the fall of a tyrant who for decades seemed unassailable—and concluded that if it can be done in Tunisia, it can be done in Cairo and Alexandria as well. For them, the actual course of events in post-Ben Ali Tunisia is of far less importance, and, from their perspective, rightly so. Santayana’s celebrated remark that those who forget the lessons of the past are condemned to repeat it is fatuous for many reasons. Not the least of them is that the lessons we draw from events are often based as much on what we have misunderstood as on what we have correctly apprehended. To put it starkly, what may still turn out to be a false dawn for the people of Tunisia is already an inspiration to the rest of the Arab Middle East.